Soak it in water till bubbles disappear before use. Stone must be flat and thus use the whole surface of the stone as far as possible. Remember to rotate the stone 180degrees from time to time so that you maximize use of both ends. Use the four corners to sharpen the tip and end of the knife. After using, remember to wash it and flatten it with another rough stone and keep it dry. Which grit stone to use? Finishing (4000 + above) For a fine or superfine finish and to be a Kitchen Samurai! The Key Operative guiding principle is how much you need to sharpen or to put it in another way.. How much steel you need to remove to have it sharp? The more blunt the knife, the more steel you need to remove. And if it is your desire to do it in an inefficient manner by using a finishing stone to do re-edging… may the force be with you! Also, is it a hard steel, HRC 59 to 65 (most Japanese knife) or medium steel, HRC 52 to 56 (most European knives). For harder steels you need to start with a coarser grit stone. Thus I progress from a rough stone to the finest stone. Normally, it is either a 3 or 4 stage process.. Thus you should have a minimum of 3-4 stones depending on the starting condition of your knives before you sharpen them. The more blunt it is, the more steel you need to remove and the rougher the stone, the faster the process. Preparation. Soak stones in water till bubbles disappear. Best place to do it is at the kitchen sink where you can have plenty of water. Best to put it across the sink bowl with a wooden plank and get a comfortable height by raising the stone with another stone or a block of wood. IF you are putting it on the divider of the 2 sinks, this can be dangerous as it is narrow and it can wobble and fall off and in the process, you might suffer a cut. I emphasize safety and a good working comfortable height is important as it is less tiring and be consistent with this as eventually, you will develop the feel and a constant angle that you are comfortable with. Have ready towels or rags to wipe knife and hand dry as you really cannot feel the edge with a wet hand on a wet knife. Now you are ready to work on the first stone. The angle. Personally, the more acute the angle, the sharper it is as the bevel is thinner. Generally, good kitchen knives come in either 21degree or 15 degrees (Japanese Knives) per side. Total either 42 or 30 degrees, and in the case of a single sided Japanese knife.. only 15degrees. For your reference, a shaving blade is about 10degrees. It is my experience that German knives can be shaved to 15 degrees and still be quite strong. I suppose that most manufacturers have to cater to the masses who tend to neglect and abuse their knives, therefore having them at 21 degrees gives better edge retention as it is stronger than an edge of 15 degrees. How to hold the knife? Hold the knife comfortably in your dominant hand at the angle that is required, and hold it firm with the thumb and index finger over the spine. The thumb or the 2 fingers of the free hand will be placed approx. 5mm behind the edge to guide the sharpening motion. Hold knife firmly and aim for so long regular stokes. Do it slowly till you get the hang of it especially on a more abrasive stone as it cuts fast. So you start shaving on side A till it curls up on side B. This is known as the BURR or a WIRE EDGE. It means you have shaved enough steel on one side that it has curled onto the other side. Unless you have eagle eyes, it may be difficult to see the burr. Best to use the flesh of the fingers or thumb and stroke from the spine toward the edge. You can feel it. Turn the knife over to side B and sharpen till you get a BURR on Side A. Thus you now have perfect edges on both sides. With a few careful gentle strokes, remove the burr on the other side and progress to a finer stone after washing it. To remove the BURR, work with light pressure on ALTERNATING SIDES, then featherlight pressure as final touches. Feel for the burr again, after a couple of alternating strokes, it ought to have been removed. On stones above 2,000 Grit you will start to see the shine on the sharpen edges! Then move on to the next level that you desire! Do remember to feel for the burr every now and then. Beyond 3,000 grit, it takes a long time to get a burr and that is fine. Rinse the knife with running water, wipe it dry and feel and observe the edge. It should be shining by now and ensure that is even and uniformly shining. There should be a “biting feel” on the finger thumb or finger when you gently run it across the blade. This is the feeling of the fine cutting edge digging into the grooves of your fingerprints. Alternatively, you can run the whole blade between the thumb and index finger (when it is wet). Repeat this process with a higher grit till you are satisfied. Some proponents suggest that after finishing it, it is best to sharpen say the last 10 strokes on each side at a higher angel say 20 to 25 degrees for Durability. Check it out. Finally, to test your knife for sharpness, the macho guys shave hair on their forearm. For me, I prefer to use A4 paper and feel and observe how it cuts. It should be straight down and cut smoothly. If you are a beginner, after using each stone, test and feel each cut. IF you do not notice and feel the difference, then no point going further. IF you can and like it then progress to a higher grit stone and that is your standard! Note, once you have tasted the silky smooth fine cut, there may be no turning back! Personally I can feel the difference of cut between each stone. A parting shot, sharpening a knife is an art and not a science. Basically you need to understand basic geometry about angles, figuring out how hard is the steel and abrasion. How to do it? I have given you the basic process and it is up to you to discover your own style and preference. The basics remain, control the angle, you remove steel and you progress with a higher grit. Remember the BURR. Use your senses. Always feel and observe and after a while, you would develop your own preference for certain grit stones as each gives a certain feel when it cuts. Sharpening can be relaxing and fun when you start getting good. It is a simple process of taking away steel gradually at a 15 to 20 degree angle. Practice makes perfect and you’ll eventually get there! Just as a paintbrush is a painter’s primary tool, a knife is a Cook's apparatus for which he does his preparation for his magic! If you have purchased the sharpening stone from us and need a demonstration let us know as arrangements can be made. If you need to test the stones first before purchasing, testing stones are available on our premises. Do take note that I travel quite a fair bit and might not be around to show you. 1. Do keep the stones watered. The black watery liquid is called slurry. It acts as a lubricant and if it is dry, add a few drops of water on the stone such that it acts as a lubricant. It is also a great cutting agent too! 2. If the metal shavings stick on the surface of the stone, use a small nagura stone/diamond plate or any slightly rougher stone to scrub it. This will present a new sharpening surface for shaving the steel! This is the beauty of Japanese stone, a fresh cutting surface for sharpening every time. 3. Keep the stone clean and flatten it after each use with a rougher stone. 4. Remember to use the maximum area of the surface as this would be faster than say sharpening on the same spot: rotate 180 degrees from time to time and use the corner for the tip and back end of the knives). I always prefer to use an 8inch stone; 2.5 to 3 inch as each stroke gives me more abrasion with each stroke and saves time! 5. Testing of how sharp is the knife? I use a piece of standard A4 paper to see how well and smooth it cuts and whether it cuts straight! Remember to feel how it cuts and how smooth it is. Another method is to feel for ‘bite’. 6. Sharpening steel - it is a misnomer. It does not sharpen. It is a Honing steel. Honing is required form time to time because as you use the knife, contact with a cutting or chopping board takes the edge out of alignment. Thus honing will only align the edges and you will have the sharp feel again! It is an essential. A butcher will use smooth sharpening steel. You can use a diamond sharpening rod to have more bite or a not so smooth metal sharpening rod. I like ceramic rods, but drop them and it breaks. DO NOT apply pressure when using rods/steels. Let the weight of the knife drop over the steel gently. Say 5 stokes and that should be it. Ever notice that the pork seller uses a steel and the fishmonger does not? He uses a smooth stone with water. And yes, the hawker using the bottom of a bowl to hone his knife? 7. Use your senses … ears, sight and feel. Sound: With a rougher stone, whilst sharpening your knife, you can hear it as a scraping sound especially when you are doing the Burry side. IF it is gone.. the sound is different! The sound also becomes more refined as you move up the grits! Sight: The amount of slurry and how well the knife slides/glide on the stone; the shine and whether it is uniform across the blade. Feel: Learn how to feel the BURR on the edge and ‘bite’ of the knife with the thumb or fingers. 8. European knives and Japanese knives: European knives tend to be medium rated as 54 to 56HRC hardness. Good Japanese knives tend to be in region of 59 to 65HRC. Take note that the harder the steel, the longer it stays sharp and when it is time to sharpen, it is literally harder to remove the steel (sharpen) and hence the importance to use the correct grade of stone! Harder also means more brittle. So no bones or frozen food or nuts! Note.. For Japanese knives (harder steel) start on a lower grit stone.. Say 400 to 600 always, as it is hard steel and you need a lower grit stone (coarser) to shave away the hard steel faster. Unless you prefer to do it painstakingly for days with a fine high grit stone. However, this does not apply to the high carbon steel knives. 9. Always wash the knife before sharpening as oil is the biggest enemy of the Japanese water stone. Once it is absorbed you cannot wash it off. 10. Always rinse the knife before proceeding to the next stone as you do not want the rough grits on the finer stone. 11. After sharpening on the finishing stone, put a thick stack of newspaper flat on the table and stroke it say 5 times on each side (spine side leading) and see whether it makes a difference? Some proponents prefer to strop on leather with some rubbing compound. 12. Pressure: You do not have to press hard on the knife. When you are trying to remove the BURR, use gentle strokes to avoid the unwanted BURR on the side that has already been de-burred. On the polishing and finishing stone, you may also wish to count say 5 times on each side and turn over the other side. Some do it on alternative sides.. whatever turns you on.. As long as you do not create another burr after de-burring the other side! For the final strokes on the stone, best to push/pull away from the direction of blade on the stone. 13. Once you have sharpened your knives, observe the results on the food that you cut.. See whether it is a clean and smooth cut. You would then appreciate a sharp knife as it cuts clean and straight and you have a clean finish. And of course the FEEL when it cuts. Try it on mangoes and you will see and feel the difference! 14. Wrong angles.. Will you destroy your knife with the wrong angle? At worst, it is too thin and will not hold the edge. 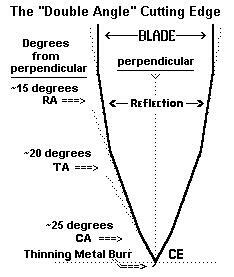 It is unlikely that you will sharpen at a 10 degree angle as it is too low. Observe how wide the new shaved area is when you sharpen it. Some suggest that you color the edge with a black marker pen so that you can see the new edge. It should be no more than 1.5 to 2mm. Wide enough for you to work at the higher finishing angle and of course a thinner shining edge. Hopefully, you will learn to use all your senses in everything that you do. Not only in sharpening but also in your cooking! It will make a difference in everything that we do and we learn to be focused on the task on hand. Cheers from the Razorsharp team!